Like many areas around Hamilton Purdie Street was a typical Victorian tenement street. It was thriving and most of these tenements in the late 1800s would have been occupied by Coal Miners. 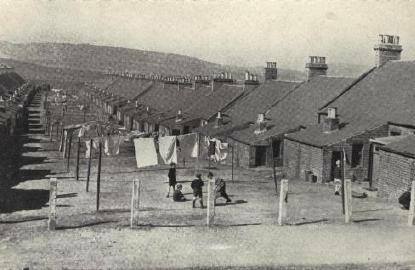 When the Coal masters started to sink their pits, places like Burnbank (which at the time was a quiet little village on the outskirts of Hamilton) started to massively grow and houses were quickly built to cope with the amount of people moving to the area for work. One family that lived in Purdie Street in 1916 were the Kidlay Family. It was reported in the Hamilton Advertiser on Saturday the 15th of July 1916 that Matthew Kilday, pony driver, residing with his parents at 4 Purdie Street Burnbank, met with an accident while at work in the Kiltongue seam of No 3 Pit, Earnock Colliery. The tenements were demolished in the mid 60s partly due subsidence from the underground coal mines and also to make way for the new Burnbank shopping centre. 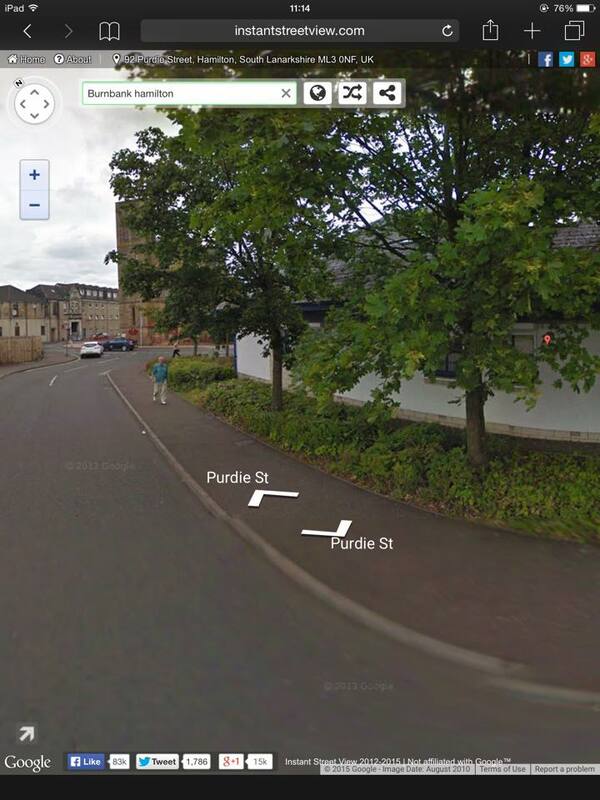 Below is a picture of Purdie Street and a more recent photo of how it looks now! The street is now a car park and entrance to the shops. Maybe one day we will see Purdie Street a thriving street with houses. EDDLEWOOD COAL MINER FOUND INJURED UNDER A BRIDGE. It was reported in the Aberdeen Journal on Thursday the 21st of September 1933 that pedestrians passing a railway bridge, near Hamilton, around eleven o’clock at night heard moans coming from thirty feet below. On investigating they discovered a man who was obviously in a very serious condition. They carried him to a nearby hall and then communicated with the police and a doctor. The man who was found to be David Crookston (43) a miner from Eddlewood Rows, Cadzow in Hamilton. He was later moved to the Glasgow royal infirmary suffering from severe bodily injures. While cause of the accident is unknown, it is believed that crookston mistook his road in the darkness and fell over the bridge. After reading this article I wanted to do some research on David to see if he managed to survive the fall. It turned out that he did survive and after he recovered he was sent back home. The story ends not a happy one, as four years later David was found dead at his home at 63 Eddlewood Rows. He was found at his house at 12:00 midnight on the 6th August 1937. On his death certificate it stated that “The body had appearances consistent with gas poisoning” David was the son of Robert Crookston & Janet Scott, he left his wife S Crookston (Maiden name Kelly) and at least one son. His son Robert of 17 Annsfield Road in Eddlewood was the informant of his death. Posted on August 28, 2015 Categories UncategorizedLeave a comment on EDDLEWOOD COAL MINER FOUND INJURED UNDER A BRIDGE. THE NETHERTON CROSS OF HAMILTON. The oldest symbol of Christianity in Hamilton is the Netherton cross. The cross originally stood on a settlement at Netherton approximately 60 yards to the north of the motte hill which later became part of the Duke of Hamilton’s estate. This part of the estate was later called Low Parks and would have been known as this up until the construction of M74 Motorway in the mid 1960s and then Strathclyde country park and the early 1970s . The land where the cross stood is situated alongside where the now M74 motorway is and it was just across from the Hamilton services, there is now a marker stone in its place. The cross dates back to the eleventh or possibly the tenth century which meant that it was carved around the year c950 -1100 and it would have been influenced by other known Pictish sculptures. In 1857 the town council appointed a committee to confer with the Duke of Hamilton’s manager about plans to conserve the cross and ten years later 1867 the provost of Hamilton was requested to communicate with the Duke’s manager to have a railing erected around it to protect the tracing & carving as the local farmers at the time would have used the cross for tethering their livestock to it. The cross was moved from low parks to the Hamilton Library at some point between the late 1800s and the early 1900s and In 1925 the town council agreed that Netherton Cross should be moved again and erected at the front of the old parish church. The cross was moved at a price of £30, this would have been £1,628.38 in today’s money. The cross has been under the protection of the Historic Monuments Commission since 1933. Further efforts were made to protect the cross during the second world war when the cross was bricked around and filled with sand so it would be safe from the danger of bomb blasts and air raids. In 1972 the cross underwent a three-week face-lift to establish if it would have to be moved indoors due to weather damage, an expert from the Historic Monuments Commission stated that cross could remain outside as long as it receives regular attention. Today the cross is a reminder of the origins of Christianity in Hamilton and also provides a link to our Celtic church of the past, to the old parish church of Hamilton. If you would like to come and see this amazing relic then is can be viewed at the entrance of the old parish at Cadzow Lane. Historic Hamilton would like to thank Scott at the Hamilton Reference library for taking time to look out and donate the old pictures of the Netherton Cross. Posted on August 26, 2015 August 26, 2015 Categories Uncategorized3 Comments on THE NETHERTON CROSS OF HAMILTON.